Ecru beading threaded with pink satin ribbon runs on either side of a delicate antique lace insertion. Wide pink satin ribbon ties the bib front and back at the side. 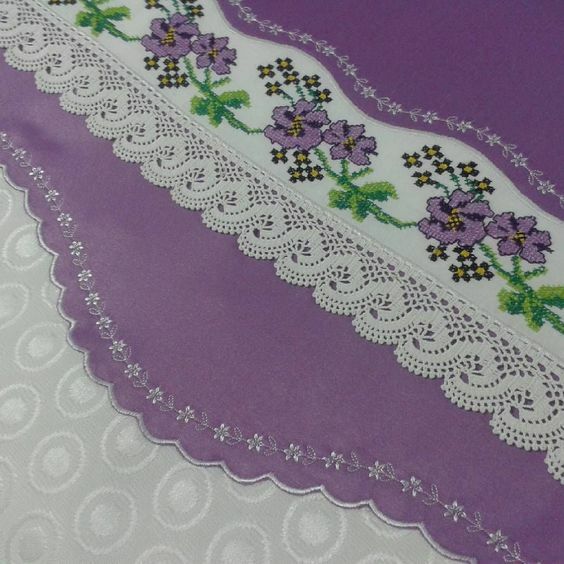 The English lace edging is patterned with a graceful bow. It is joined to the batiste all around with ivory entredeux. The edging at the neckline is a smaller ivory edging. 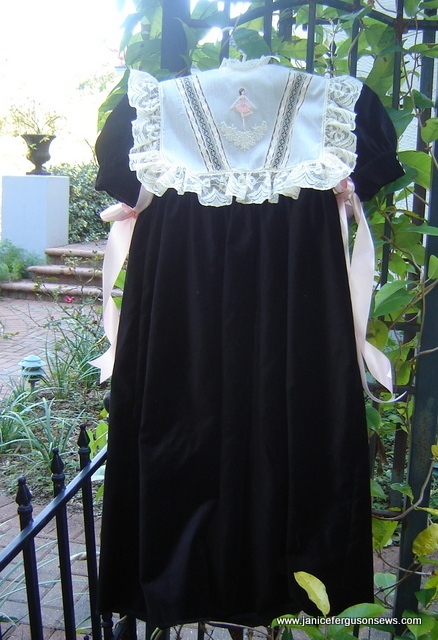 The black cotton velveteen dress has a dropped yoke and banded sleeves. Three tiny pearl buttons are stitched onto the band for a break in the dark color. The dress pattern is Hope from Children’s Corner. 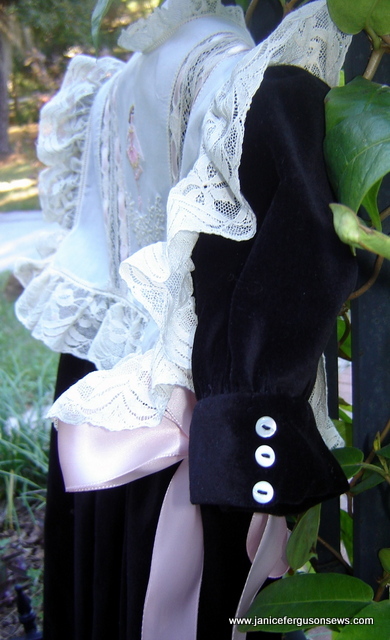 I especially like the peekaboo bows on the sleeves and pockets. This versatile pattern was originally purchased to make a school dress for Laurel. But it certainly can do the job for any dropped yoke dress. It’s a bargain when so many variations are offered. I love everything about Christmas. Making Laurel’s dress and pinafore bib certainly got me in the mood for Christmas sewing. While I sewed on buttons, finished the raw ends of lace and did the other handwork, I had plenty of time to think about all the other preparations and the boys’ outfits yet to be made. Have you started any Christmas projects yet? 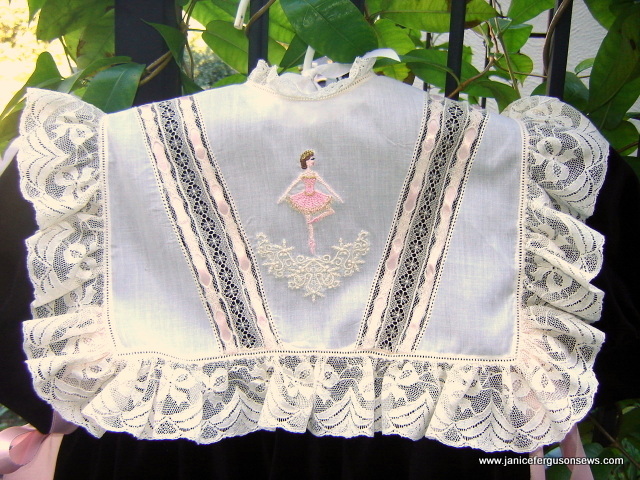 This entry was posted in brother-sister, clothing, girls, heirloom sewing, Holiday Projects, machine embroidery, serger and tagged christmas dress, heirloom dress, heirloom lace, machine embroidery, pinafore bib, Sugar Plum Fairy embroidery. Bookmark the permalink. 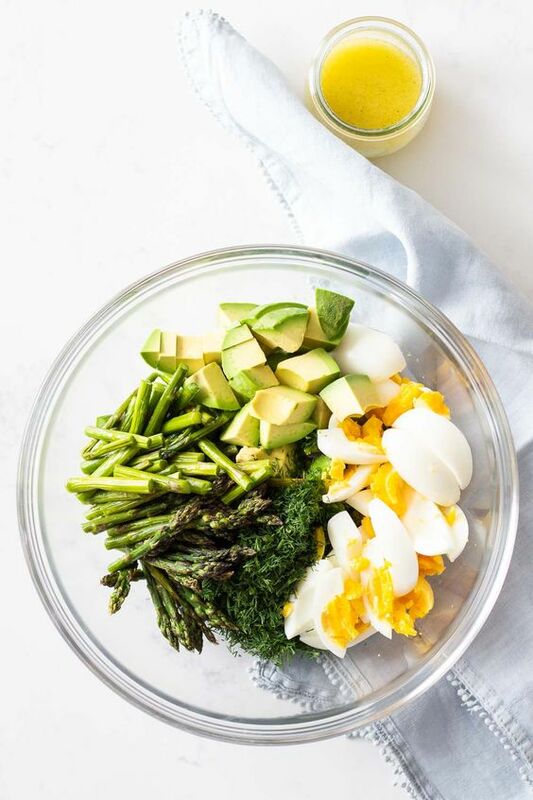 Oh, that is beautiful! I love the airy pinafore bib and the embroidery is gorgeous! The designs always look nicer the way you sew them than they do in the ads. I can’t wait to see your boys’ outfits! I have not started on Christmas sewing yet, but I hope to soon! This is beautiful, the embroidery adds a special charm to the heirloom pattern. Absolutely beautiful! The laces and Swiss really soften the black. And the dress is so versitle because many seasonal bibs can be worn over it. I am busily working on the 2 pink velveteen dresses for my granddaughters. They are smocked from the shoulder to the midriff. Cut out the matching American Girl doll dresses today–hope all this gets finished by Saturday afternoon. Like you, I really enjoy this type of sewing and have more ideas than time. Thank goodness for the Christmas music, it has really helped me get in the spirit! Lovely, lovely, lovely! This ensemble is just stunning and sure to turn heads at the ballet. The pinafore bib is such a sweet confection of lace, ribbon, and embroidery. I love it! Thanks for your kind words. I am really looking forward to seeing our own Sugar Plum Fairy with her brother, the Nutcracker himself, all decked out for this holiday classic. This is beautiful!!!! Any way I can order one for my daughter? I am a ballet teacher and it’s hard to find something this sweet and beautiful that is unique. Thanks for the compliment, Jenny. In the past I did a lot of custom orders like this, but now I am focused on sewing for my grandchildren. This isn’t a complicated garment so surely someone else would like to make one for the ballet teacher’s little girl! Let me know if you want referral to another stitcher. Where did you get the black dress? Jessica, I made it, using the Children’s Corner pattern, Hope. Details are in the post. Is the ribbon that ties under the arms 1 1/2 inches wide? Jessica, I think the pink ribbon ties were 2″ wide. The dress hangs at my granddaughter’s home across the state so I can’t check. But either 1 1/2″ or 2″ ribbon would be fine. I am just now seeing this! So lovely! Can u tell me what pattern u used for the bib? Thank u!!! Brenda, I’m glad you enjoyed seeing this. The bib is from an old Margaret Boyles book, Pinafore Bibs. A google search turned up this link Margaret once said that when she put an heirloom “bib” on her first granddaughter, the child balked and refused to wear it. She declared that she was too old for bibs. So Margaret renamed it a Pinafore Bib. That worked. 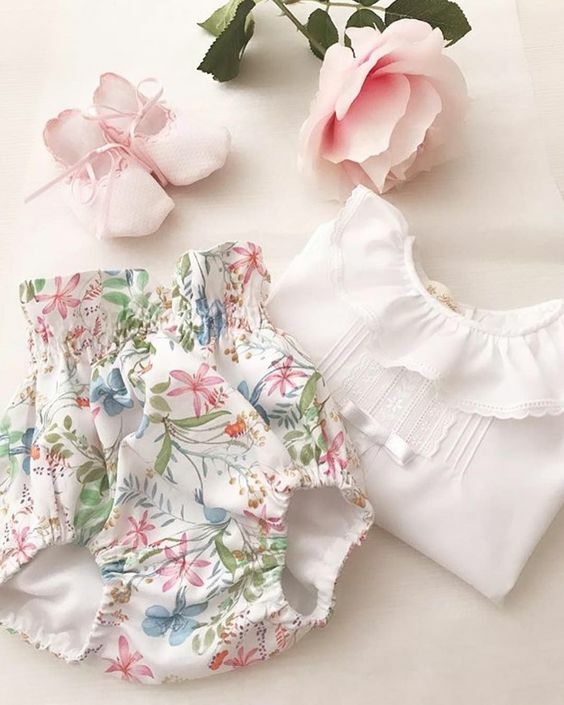 These are so nice because you can make different seasonal or special bibs to fit over the same basic yoke dress.